For centuries, women have been working elements of masculine dress into their wardrobes. Clear back to the 16th century there are plenty accounts of the scandalous dress of women wearing high-necked doublets. Then and even forward it is well known that women's riding habits took after men's and were made by tailors, not mantua-makers. We're all also very aware of the 20th century triumph of women in pants, to go along with our suffrage, work, and social advancements outside the home (a work in progress still). So none of this is new, and that's wonderful, and that's to be celebrated and continued. This topic is often a quagmire, though. I find myself asking why I choose more masculine clothing over feminine, and what this says about how I view femininity. Is it okay to dress this way if you're a feminist, or am I rejecting femininity?....and on and on. Ultimately, though, I just wear what I like, and I believe that anyone should have the choice to do so without clothing being reserved just for men or just for women. Pair mannish elements with feminine ones. Mix and match any and all of the following style elements. Do as much or as little as you like. It's the juxtaposition that creates a menswear look without losing your femininity. No matter what century you're in, there are items of women's clothing that are derived from menswear. The materials, construction, and trimmings may all be found on a man's garment, but the cut, fit, and proportion is for a woman. All of my outfit is made for a woman, but done in a menswear fashion. 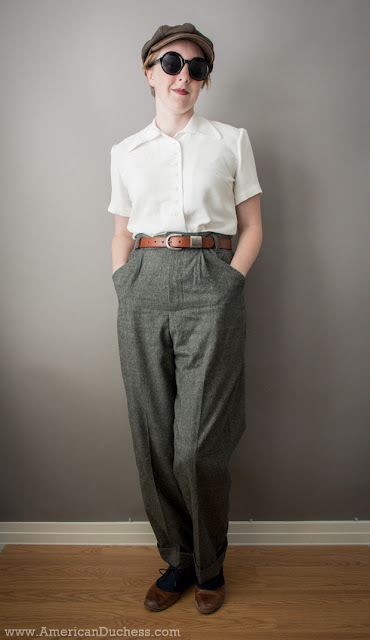 Example - my most recent 1940s trousers are made from a women's pattern. My shirt is for a woman, my shoes are for a woman, my jacket is for a woman. What I mean when I say "for a woman" is to do with size, cut, and fit: The blouse has darts for the bust; the pants are cut to accommodate hips; the shoulder width across the back of the jacket is narrow. The whole look put together is masculine but still sized and cut for a female body. When choosing patterns, choose women's patterns and make them up in classic menswear materials - or do the opposite! Choose men's patterns and make them in classic feminine colors and materials. Either way, make sure the clothing fits you well - room in the bust, tailored through the waist, not too wide across the back, proper sleeve lengths, etc. 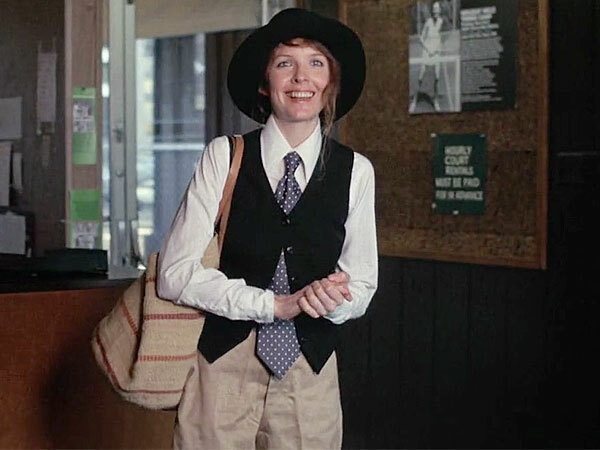 Diane Keaton in "Annie Hall" - vest, tie, slacks, hat, but all worn in a way that is her own and very feminine. In men's formal clothing we tend to see the same items throughout time - pants, waistcoat, jacket, collared shirt, tie/bow tie/cravat/stock. They don't all have to be worn together. These days men often don't wear a waistcoat with a suit. It's common for men to omit the tie. It's also common to not wear the jacket. These are various levels of formality. Easiest way to achieve a menswear look? Put on a tie. Next easiest way to achieve a menswear look? Put on a vest. And nothing has to match. Any combination of these items in a classically mannish material will work, but you can also create these items in feminine prints or colors to skew the norms a bit. Men's clothing is usually made from heavier materials than women's, and seldom has any stretch. This does not mean you have to wear "hard" cotton shirts or bullet-proof jeans, though. Try mixing-and-matching a soft silk blouse with well-pressed wool trousers, or a starched cotton shirt with more drapey, pleated linen pants. 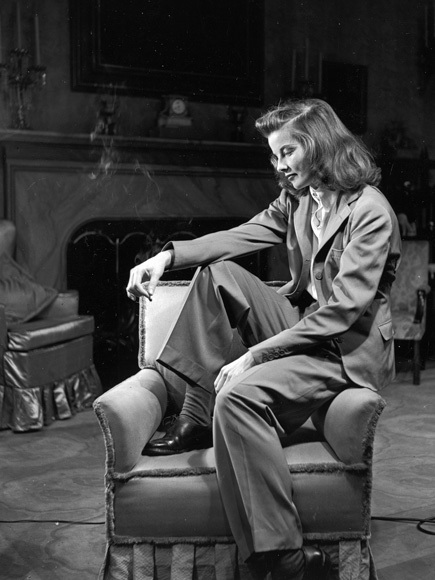 Example - If you're making a '40s style women's suit with tailored blazer and skirt, try it in a structured pinstripe suiting. The material choice will give it the menswear vibe despite the feminine design and cut. I don't know who this is, but she's my heroine. Great example of mixing and matching lots of different traditionally menswear fabrics, colors, and patterns. We're all very aware of the modern "pink is for girls, blue is for boys" division in our Western society. Play with this idea. Color alone can create wonderful juxtaposition. For example, if you're making a very mannish three piece suit, what if you used a smokey lavender wool? Conversely, if you're making a 1950s frock, what if you used an olive green or brown tweed? The Danish Girl - This was one of my favorite outfits from the film - it's a transitional ensemble helping to tell the story of Einar becoming Lily. It's 1920s menswear because of the pieces - blazer, trousers - but it's feminine because of the cut, drape, and pairing with the wide-collared silk blouse. On a man or on a woman this outfit blurs the lines. Hats - flat cap, newsboy cap, Greek fisherman hat, trilby, fedora, etc. Driving Gloves - string back, perforated, fingerless or not. Shoes - oxfords, spectators/two-tones, anything brogued. You can also use accessories in reverse - wear a cloche hat, silk scarf, brooch,and high-heeled shoes with a very masculine outfit. 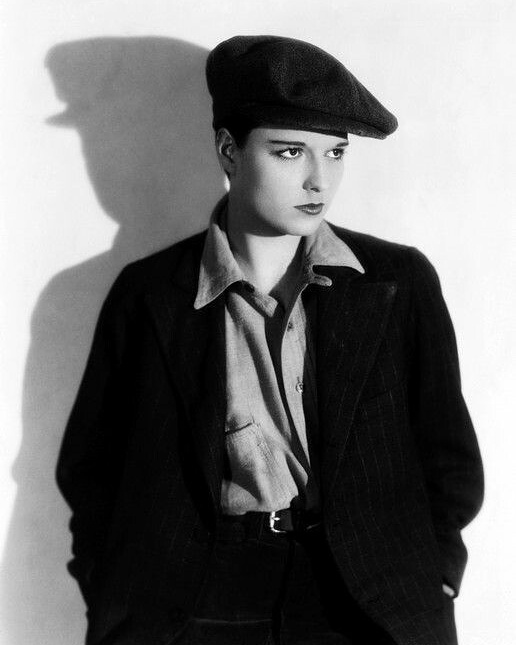 Louise Brooks in menswear and accessories, but wearing strong 1920s makeup. Depending where in history you are, masculine trim changes. For instance, lace and ruffles, metallic braidwork, floral embroidery were all the rage for men in the 16th - 19th century, but not in the 20th century. Interestingly, all of those things have become exclusively feminine. You can use these elements, though, to create ... say it with me ... juxtaposition. Just like with the accessories, the way you trim parts of your outfit will balance your look between Venus and Mars. I put this far down on the list, but this is one of my most important. Whenever I dress in a masculine way, I always do my makeup. It doesn't have to be heavy makeup, but I make sure my brows are arched, my eyelashes are mascara'd, and I've got lipstick on. I focus a bit more on makeup because I have short hair, but for those of you with long hair, wearing a very feminine hairstyle will instantly offset the masculinity of your outfit. 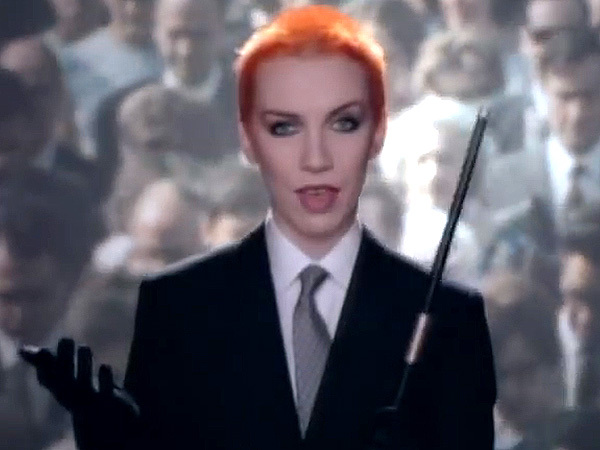 Annie Lennox - a suit and super short hair, but strong makeup. These are just tips, guidelines, ideas, musings. There are no rules - I want to stress that. Your personal style is about what makes you feel "you." Have fun with it! Express yourself! Don't be afraid. Whatever juxtapositions you might choose, rock it. After all, confidence is always in style. I love the gender bending adoption of menswear, and I love the really androgynous dress of many of the women in our local community too, who skip makeup and soft anything entirely. SO not my style, but I appreciate it. I just wish men would be willing to adopt aspects of feminine clothing too, not just the odd floral shirt or tie. My androgynous male friends are also IMO gorgeous, but often both groups get a very hard time in public. Politics and fashion indeed! I always wore pieces of menswear. When I was a student and short of money, I choose sweaters and jackets similar to those of women's fashion - but men's fashion was less expensive (and no, I don't know why ...). In later days, I always loved the classic look of tweed jackets, sweaters and hats, and men's jackets and coats had all these pockets inside, long before they were made for women's coats. And - I always thought that men's fashion on a woman emphasizes her feminine looks - and the other way round: men with buns, men in skirts, men in mint green mohair sweaters - yes! wear it with confidence, and you'll look great! :) Thanks for your wonderful blog! That picture of your 'heroine' above - I love it a fierce amount, what a fantastic outfit. I love this post. There is something so sharp and clean about the lines of menswear and I love patterns like tartans and houndstooth. I hesitate to tell you how many plaid jackets and driving caps I own! p.s. Look for me doing my best impression of Dr Mac during the day at Costume College! A very good post! I definitely picked up some pointers here. I have a very "un-womanly" figure, and I don't move very feminine either, so I need to take extra care to not end up looking like a man.